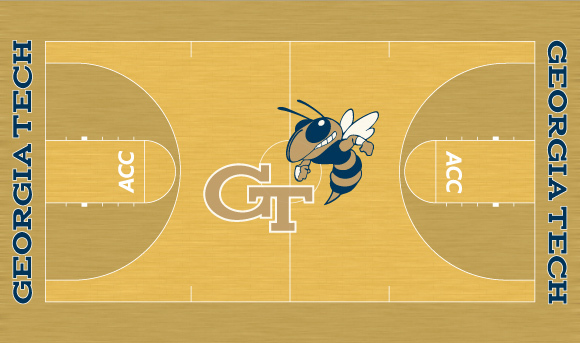 I know I’ve posted two Georgia Tech concepts on this blog (football, basketball), but just let me add this and I’m done; just gotta get it out of my system. Thank you for providing me with some of my favorite moments of my adult life — somehow ending up down one row from where I started at the Alamodome celebrating Will Bynum’s layup that sent Georgia Tech to the National Championship game, completely ignoring the massive headache I incurred while taking an elbow to the head in the process, screaming at the TV as Roddy Jones ran down the sideline in Athens to add to a lead against the preseason #1 rival Georgia Bulldogs, and taking a trip to Tampa to watch the Jackets win an ACC Championship, no matter what the NCAA says. I love Georgia Tech sports. And that’s why it’s difficult for me to see them have such inconsistency in another thing I love — graphic design in sports. Within the Georgia Tech community, we’ve given ourselves a reputation recently of “caring too much about uniforms,” partly due to football coach Paul Johnson saying he’s never had so many questions about uniforms. I don’t think we care about them any more than any other fan base; I just think we’re unhappy with the current state. In the Chan Gailey days, I didn’t hear any Georgia Tech fans talking about uniforms. We were talking about Chan Gailey. Sports fans complain about the things they’re unhappy with. If Paul Johnson doesn’t want to hear about uniforms, he should have a couple 7-5 seasons. For me, it’s not just about uniforms, though. Being a graphic designer, it pains me to walk into the Georgia Tech bookstore and see 3 different shades of gold apparel. It annoys me when I see black and yellow Georgia Tech bumper stickers. Every time I see a Georgia Tech state-issued license plate, I wonder where the skinny version of the GT logo came from. These are the things that make it more than just a personal distaste for our football uniforms. Georgia Tech has a brand consistency issue. Coca-Cola wouldn’t allow multiple shades of red to be sold in the World of Coke gift shop. Nike wouldn’t allow thinner and thicker versions of their swoosh to be printed on merchandise. So why should Georgia Tech as a brand allow these things to happen? But this letter isn’t just a complaint. I love Georgia Tech, and I work in this industry, so I’m offering a solution. The beginnings of one at least. First, establish one gold. I understand why there are two golds now — the Buzz gold and the Ramblin’ Wreck gold — but it’s confusing. Pantone 124 is used on Buzz and football field graphics, 874 is used on the Ramblin’ Wreck, sports uniforms, and the basketball court, both are used for logos and merchandising, and both golds are paired with both navy blue and black. My recommendation would be to ditch Pantone 124 and black altogether. The school’s colors are “old gold” and white, and navy blue is the tertiary color, so they should be used for everything. They’re already used on all the sports uniforms, so why can’t everything else get it right? The biggest change would be Buzz. He would now be gold and navy, not yellow and black. I understand real yellow jackets are yellow and black, but there are many schools whose mascot is the school’s true colors instead of its real-life colors. Even if this was a non-negotiable and Buzz had to stay yellow-gold and black, stop there and don’t use them anywhere else. Then, for all merchandising, uniforms, and logos, it’s Pantone 874, white, and Pantone 539 (navy blue). Once the colors are established, there are a few things that need to be updated. 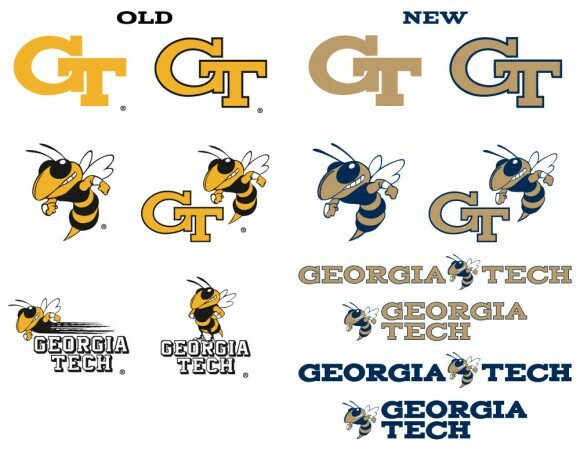 First, the typeface with the thick block shadow used for the “Georgia Tech” wordmark is very dated and needs to be replaced. I would recommend a slab serif typeface that matches the interlocking “GT” logo, something like the custom type I’ve done below. The simple, serif type would set Georgia Tech apart from all the cookie-cutter college sports identities as a more prestigious academic institution in addition to being a major college sports program. Standing Buzz is ok for promotional use since it is an illustration of the physical mascot, but the standard buzz above should be the only one used as an official logo. The flying Buzz with a trail of black behind him should go into retirement with the block shadow type. Once you have a consistent brand, you’ve got to implement it in all areas so it’s just that — consistent. I’ve gone ahead and applied it to a few things. One problem with the uniforms in all sports has been the shade of gold. It’s been closer to Pantone 874 than 124, but it hasn’t been either. It’s been more of a light, yellowish “Vegas gold.” With this new, consistent brand, it will be important to match the proper gold as closely as possible. I’ve done that with the football uniforms below, and as I explained in greater detail in this post, using this darker gold will set Georgia Tech apart from other gold teams with lighter shades, like Vanderbilt, Purdue, and Colorado. I’ve also simplified the jersey style, using elements of Georgia Tech’s past uniforms, which is also described in detail in the football uniforms post. I applied this new style to the basketball uniforms as well. The only thing I didn’t carry over was the new wordmark since the text on the jerseys is based on past Georgia Tech basketball uniforms and I thought it worked well. The football and basketball jerseys share stinger-inspired pants stripes. You can read more about the basketball uniforms here. The football field currently uses yellow-gold field paint despite the team jerseys and the Ramblin’ Wreck being metallic gold. Here’s a field design using the proper gold and new wordmark. It also has yard marker numbers in the typeface the wordmark is based on. Here is the basketball court with the new colors and wordmark. With gold being the predominant school color, it’s a perfect opportunity to take advantage of the stained wood basketball floor trend. Like I said, I love Georgia Tech. And I love seeing good, consistent branding in athletics. I think it’s time to make a clean break from all yellow and black and any outdated typefaces and logos and move forward with a consistent, unique brand that’s unmistakable for Georgia Tech. The interlocking GT logo and Buzz are both iconic, and gold, white, and navy blue should be as well. Plus, what better way to open a brand new basketball arena than with a beautiful new court that fits in with a new identity system? As a lifelong Georgia resident, I’ve always been confused with Tech’s color scheme. Your proposal seems like a much clearer and better approach to the GT brand. Plus, the gold and blue buzz looks a thousand times better. Excellent job! I totally agree regarding the need for consistent image branding. I don’t believe anything will be done about it, but I admire your effort. I question the Institute’s competence when it comes to the marketing side of things…. This is perhaps the best GT fan post I have ever seen. I really hope that D-Rad and Wayne Hogan have a chance to see this. I will do my part in Twitterland. I think this post also speaks to a greater GT issue – unity. Exhibit A: whiteout games. Keep up the good work, Steven! I wholeheartedly agree to this proposal. I really hope the Institute will take a serious look at the branding efforts they are currently implemented and i really hope they see how far off comparatively we are. If we could standardize our colors and upgrade our look, it would go a long way to changing the perception of our Institute in the state. I think this proposal upholds the tradition that we all cherish as well as brings us into the modern world. Great post Steve! Hopefully, the AA will take it to heart and make much needed changes. Thank you so much for this post. As a current GT student and huge sports design fan (and longtime-ish follower of your blog), I completely agree. I’ve always hated our school’s brand inconsistency. I’m posting this on my facebook and I’m sure many of my friends will agree with you. Thanks! First, I am not one to give platitudes without knowing the person, but this letter/post is truly inspirational! KUDOS! I totally agree with you on every single count. Too many versions and too many colors period! I look at Texas as an example. Burnt Orange. It’s not a common “color” but they do it right. One version. So with GT and its’ image why can’t we just accept the colors as you’ve stated! Out with the PMS 124! It’s FUGLY and it’s not “Up With The White And Yellow”! DRad…..listen to this man. Let’s get this straightened out and make it official. And thank you Steve Little….you obviously put lots of time and effort AND heart into this letter along with your thoughts. For goodness sake read and pay attention. GTAA should be all over this and taking action to make it happen. great analysis. I think that if this was implemented it would also carry into the mainstream public with marketing apparel. I am a long time tech fan and I am consistently aggravated by the meager choices concerning apparel. Good job. Yes! Everyone needs to get this on the GTAA’s radar screen! As a design student and a recent Tech grad, I have to say that I completely agree with everything above. If this was a petition, it would have my signature. Great Job Steven! I love this and hope that the AA will get on board. Great article! 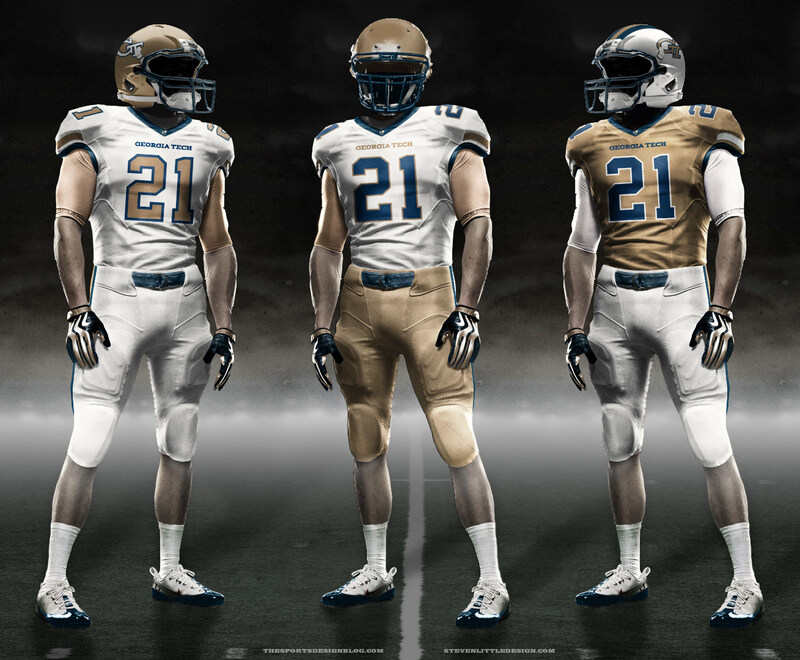 Now if we can just get the coaching staff to wear white/gold at sporting events! Oh! If I had a daughter, sir, I’d dress her in White and Gold, Completely agree with your article and with Jordan above. I’ve won many Trivia Games by asking people what Georgia Tech Colors are. Most will say yellow and Navy. THANK YOU!!! Please make sure this can be passed on to our marketing department (which by the way is highly populated with u[sic]ga grads). Glad to know I’m not the only one who realizes Navy is WAY too dominant. Go back to 1990′s videos of GT, even in a 1-10 season the stadium was way better looking with all gold. It looked even better in 1990 when Sanford Stadium was packed with GOLD. I like the article, and agree with most of it. However, I think that many different colors has benefit. You can always tell who really knows the school by what colors they refer to. As a Georgia Tech student I enjoy this superior knowledge and it makes me feel like part of the school. Also, it presents a multitude of marketing opportunities for the school and their brand. Not everyone wants to wear strictly white,gold, and navy. Honestly, I would be happy either way because ill love the Jackets till I die. Good post, but you are absolutely wrong about the Gailey years. Uniforms were a constant discussion then too. More so than today, actually. I agree completely…well said…hope this gets traction…Go Jackets! How about the actual Buzz mascot? Buzz is or is close to Pantone 124. Does Buzz deserve a costume makeover? One gold has been a topic of discussion for decades, as gold on other gold looks well, terrible. It looks bad on the shelves at stores. It looks awful in the stands, and consequently, nasty on the financial books of retail stores. I’d also like to see one gold. There are, however, some hurdles to get through. While I applaud the effort that went into this, I disagree with the conclusion. The “metallic gold” looks muted and bland, and doesn’t look good in the logos, on Buzz (the current “gold” giant inflatable Buzz looks terrible compared to the old one that was colored like the mascot suit), on the field, or on clothes (maybe OK on uniforms, but not great on t-shirts, sweatshirts, hats, etc.). You need a job in GT’s marketing department! Brand and logo recognition are critical and should be carefully planned, designed and controlled, and are very important as well in licensing. You have laid out a very good initial plan with some very valid supporting commentary. Great work! Hopefully this will AT LEAST get the GTAA to hold a focus group with alumni about it. They should just go ahead and adopt most, if not all, of what you’ve posted on here. Some of this I agree with, some I don’t. Unfortunately, the metallic Old Gold looks spectacularly good on a 1930 Model A, and less good just about anywhere else (uniforms, print, web, and as mentioned above, the giant inflatable Buzz). And none of this makes any difference if the bookstore keeps slapping the GT logo on any damn fool color they encounter — pink, green, brown, you name it. But I can tell you that both Dan Radakovich and Michael Warden (head of GT marketing communications) have received a link to this article. Thanks for posting it! I like this a lot. I have a couple of suggestions with the custom font, though I don’t have the photoshop skills to make mockups. 1. It seems like the kerning is very slightly off on the ‘O’ in “GEORGIA”. I would try tightening it up a bit. 2. The ‘G’ and ‘C’ *might* benefit from additional serifs. In the case of the ‘G’, I would suggest adding a serif on the inside of the G where the left part of the T in the interlocking logo is. On the C, I would add a serif on the bottom of the opening to balance it out. Great work on the blog; I totally agree with your suggestions. I like all of your suggestions. If any of your ideas are adopted, please publish something about that. As Jordan said above: Now if we can just get the coaching staff to wear white/gold at sporting events! I wonder if the coaching staff wears so much blue because they liked it while they were at Georgia Southern and Navy. Somebody needs to tell them and the administration that one of two things need to be done about using so much blue: (1) GT should adopt blue as a third school color and then use it wherever they like or (2) if blue is not going to be one of our colors, all clothing for football coaches (at least during games) and athletic team uniforms should be predominately gold and white. Great post! I hope y’all can make this happen. Go Dawgs! I totally agree with this. One of my biggest annoyances is that the shade of yellow/gold on football uniforms changes EVERY YEAR. They could at least be consistent. but I think the replacements you suggest could be freshier, they already feel dated. I agree with everything you said but the shadowed block lettering. What now, change the letters on Tech Tower? That font is just as much our history as our colors and mascot, if not more. Maybe remove the shadow, but never deny the block lettering of Tech Tower! Thanks for this article, I’ll see what I can do about getting it into the GTAA. Great post, definitely meriting some consideration and discussion internally. As a pretty recent GT B-school graduate, I can tell you this issue of brand recognition certainly came up more than once. I’m thrilled to see Dr. Fleming’s post on here- as a noteworthy and active alum and associate cabinet member, you can take his word that DRad and VP Warden have come across this. Awareness is the first step, and this kind of implementation is not without challenges but certainly obtainable with student and alumni support! I’m a huge Tech fan and a current student. I think these ideas preserve Tech’s tradition while also setting the stage for a modernization of our design. Not to mention, these designs get me pumped. I hope this finds it’s way to Mr. Radakovich! I just sent the link to this post to Dan Radakovich. Hopefully he takes a look and appreciates the thought behind it! I think you’ve hit the nail on the head when it comes to garnering more loyalty from the general sports-loving public. We don’t have a strong image to stand behind. You don’t have one, bold picture in your mind when you imagine GT. The opposite is true for, say, the Crimson Tide. I see and elephant and an A. Always the same elephant, always the same colors. That’s Alabama. I see their logo and I instantly have an emotional association. With GT… Unless you’re a student or alumni (like myself), you don’t have a single vision for what the school is. It’s tough to really get a foothold on public opinion that way. Great work, Steven. As a soon-to-be alum, I could not agree more. I agree with some that there is still work to be done on these mock ups (but that’s why they’re mock ups). Even the GTAA facebook page/website design are currently doused in a heavy amount of royal/navy blue and fake light reflections. Our image is sorely outdated and has the connotation of a much lower quality institution than we are. *Standing Ovation* I think consistency would go a long way. This issue has bothered me since I first set foot on campus. I think it is a paramount reason why we do not easily attract fans who did not attend. A distinct and clear identity (brand) is the cornerstone of engaging people with your cause. We may not be able to implement a National Championship by just making a decision, but we can implement this concept and start communicating to the world exactly who Georgia Tech is. Your proposal and explanation is the best justification and solution for why Tech should make this change. Thanks. One thing I’ve thought about on second thought is that the black and yellow combination might communicate better visually from a distance due to higher contrast. For an example, look at the black/yellow buzz versus the gold/navy buzz. The gold/navy buzz looks faded next to the black/yellow one. Maybe there’s a case to be made for embracing the more yellow gold for everything. Either way consistency is the key. More colors does not make the brand stronger, they dilute it. My wife and I are both graduates, with her currently getting her MBA at Tech, and the biggest complaint I’ve had over the past 9 years we’ve been together and buying our gear together is the inconsistent coloring and seeming lack of fortitude on the part of the GTAA to do anything about it. Our colors are clearly not Black or Yellow…yet we are forced, as a group, to put up with these colors in our gear. Great job on overall presentation and idea…and I would be proud to have some real consistency in our branding. I will however say, leave the standing Buzz as you said…his original coloring. Buzz is an icon and one of the greatest mascots in college sports…can’t mess with perfection. Of course I completely agree that the inconsistency of application of both brand and color is maddening. However, as with many fans, I have my own opinion of what our logo, colors, and brand should be. Therein lies the problem. Nonetheless, I’d like to use this opportunity to share my own preferences. First, I disagree that Metallic Gold should be interpreted as “Old Gold.” The tan color you’ve selected is muted and bland. Old Gold is really a vintage color of yellow. You’ll see it old GT books, penants, etc. I’m fine with modifying the color of the Wreck and football helmet to accommodate for this change from metallic (which I believe is why you went with the gold that you did). Second, navy should be in more limited use. Visiting Ramblingwreck.com and seeing the entire page in Navy Blue sickens me. As do the navy baseball uniforms we feature. We should be applying solely Old Gold and White (such as Burn Orange and White, UT Orange and White, Alabama Crimson and White) whenever possible. Simply two colors and two colors only. Navy used when the contrast isn’t great enough is OK. But I agree that Buzz, as a yellow jacket of black and gold/yellow color, is the source of much of this confusion and this must be addressed. Third, my preference for rectifying the Buzz situation is to promote the Ramblin’ Wreck as the mascot and buzz as the costumed stadium character. Many schools do this including Georgia (e.g. UGA vs. Hairy Dawg, Crimson Tide vs. Angry AL, Smokey vs the Volunteer). We should use the GT and/or the Ramblin’ Wreck as our sports logo. Further, as our “nickname” is the Yellow Jackets we should put Buzz in a Yellow Jacket (an Old Gold Jacket to be precise), the item for which we were named. I’d also love to see Yellow (read Old Gold) sports jackets sold and worn on gameday. Great discussion, I’m glad I’m not the only one with this point of view. This branding also needs to spread into the student-run organizations – especially sports clubs. With the hockey team, we took an initiative to remove all black from our identity. 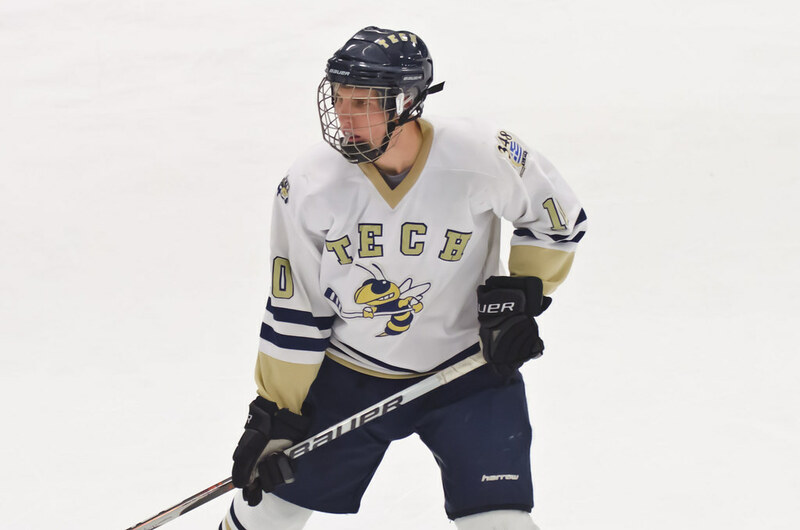 Our home white jerseys also include a gold/blue buzz and he looks awesome. We’ve also made an effort to match up our merch items. Love it! Inconsistent branding drives me crazy. There’s no reason GT can’t pull things together. Great presentation! Establishing a strong visual identity is an essential key to marketing (along with competitive and winning teams) for Tech. Sure hope the GTAA pays attention to what you have put on the design table. All Tech fans should demand it. Steven, I agree with everything you’ve said. 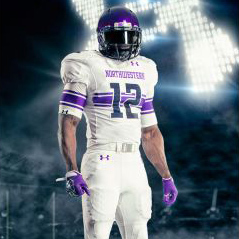 I love the football and basketball uniforms you designed. You updated them without losing the tradition. Steven — thanks for the well thought out comments and well researched observations. I’m not directly involved with Georgia Tech Athletics, but I do have some information about colors at Georgia Tech that your readers may (or may not) find useful. 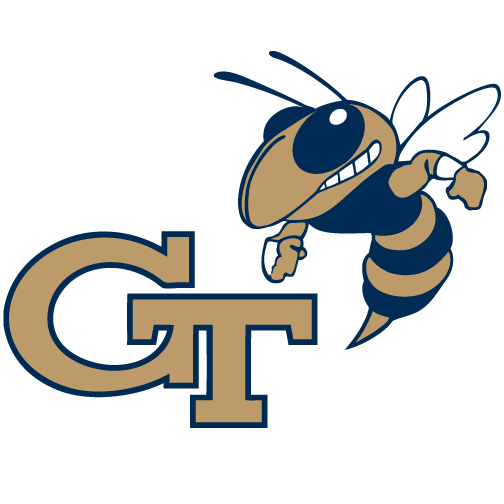 Georgia Tech Athletics is a sub-brand of the Georgia Institute of Technology. A sub-brand is a unit that is separate from, but complementary to, the core brand. Sub-brands have distinctive personalities and provide significantly distinctive services but are prominently linked to the core brand and build on the strength of the core brand. In general, a sub-brand has a distinctive market presence, has a unique selling proposition, serves unique or separate target audiences, generates revenue, and has different funding sources. Athletics provides a service that is significantly different from the more than 200 educational and research schools and programs of the Institute and has different funding sources. Consequently, Georgia Tech Athletics has a significantly different brand image from the rest of the Institute. Many universities started using “marigold” or some variant of PMS 124 as a stand-in for metallic gold in the early part of the twentieth century. Gold is a popular school color and one of the hardest to reproduce consistently. In the early days of the twentieth century, universities did not have to worry about how a particular school color reproduced across all media (print was the only medium back then) and adding a second color to a print job was an expensive proposition. Color of any kind was used sparingly. Reproducing metallic inks was particularly expensive, so when a “second” color was called for and one of the school colors was gold, “marigold” or some variant of PMS 124 was used. Marigold was also widely available as a paper color. That is one way that PMS 124 got introduced as “gold,” and not just at Georgia Tech. Most schools with gold as a school color are using some variation of PMS 124 as a stand-in for gold. Local to Atlanta, Emory University uses PMS 128 to represent gold. Another way PMS 124 came to represent gold at Georgia Tech is rooted in the folklore that establishes the “Yellow Jacket” as the Georgia Tech athletic mascot (not logo). In 1905, the Atlanta Constitution described fans who attended Tech athletic events, dressed in yellow coats and jackets, as “Yellowjackets.” Gold lamé jackets were not widely available back then, so these fans wore jackets and sweaters that pretty much could be described as a marigold color, the closest thing to gold that could be found in someone’s closet. Although there clearly is a long tradition of using something approximate to PMS 124 to signify gold at Georgia Tech and at many other schools, why keep it now? Well, there is Buzz, and Buzz does look pretty pathetic in metallic gold and navy blue, as pointed out by one of your readers. But there is another reason. Metallic gold was presented, along with PMS 124, to focus groups made up of 17-year-old potential Tech students, and it was discovered that PMS 124 was much more popular than metallic gold. Metallic gold was considered “old fashioned” by this very important demographic. A further problem with metallic gold is that the perception of metallic gold as “metallic” is a function of reflectivity. RGB video, Web, and CMYK print representations of metallic gold have a tendency to look khaki, tan, or brown instead of metallic gold. This also goes for clothing not made from gold lamé. The reflectivity of metal flakes is not present so the whole color just goes dead. This is why metallic gold is so effective as a paint color on the Ramblin’ Wreck and on football helmets (metal flakes love a hard, smooth surface) and so disappointing as a fabric dye on T-shirts in the bookstore. One last thing about fabric: It is nearly impossible to match dye lots from different fabric mills and across different fabrics. Polyester takes dyes differently than cotton. Nylon and spandex have their own challenges. Even if Georgia Tech owned its own fabric mill and limited all bookstore merchandise to one fabric, it would still be a problem to get a perfect match from dye lot to dye lot. Coca-Cola has a lot more money to spend on getting close color matches on promotional materials, and even they have issues. I hope this clears up some of the issues surrounding color implementation by Georgia Tech. We would all love to see just one gold represent Tech, but as long as metal flakes are not available in CMYK, fabric dye, and on the Web, it doesn’t seem possible any time soon. Thanks everyone for your comments. Everyone’s going to have their different opinions on what Georgia Tech (or any sports team) should do graphically, but I’m glad this has been passed around and started such a conversation. Steve, thanks for your inside info. I know a metallic gold is very difficult to represent well on non-metallic surfaces, but I still think something needs to happen to improve the consistency. If our teams all wear gold uniforms, we can’t have a yellow logo. If t-shirts and hats need to be a little lighter than the official gold so they don’t look brown, that’s fine; as long as they’re not yellow. Bravo says this GT alum. BRAVO!!! Well done Steve. I really hope the powers to be at the GTAA take a serious look at this information. I couldn’t agree more. We clearly need to be more consistent with our branding & logos. I like the thought that you have but into the redesign ideas and I do think with the new basketball arena that it is perfect time for the roll-out. But here are my thoughts. This mat gold does not pop and when it gets soaked in sweat it is going to look more brown like that on uni that was along these lines. The Colors are WHITE and GOLD. The old gold on the Wreck is an unique color and who would want to see a car in a really yellow rich gold. But we are the YELLOW JACKETS so I’m sure the jackets they started to wear were more gold/yellow than old gold b/c not to many young people go pick Old Gold first. The Gold that is used to be like Buzz are usually yellows to yellow-orange not really rich enough to be called gold. The font is based off the Tech Tower so the font is placed in history too. So what about reworking the design with the Throwback Gold that Calvin wore I was at that game and everyone was loving that uni and it rocked on TV. I agree with the idea that they should simplify everything, but I disagree with your conclusion. Some of those uniforms are terrible and even if we change to the 874, Buzz should stay the same. The gold and navy Buzz just doesn’t look right. After the comment by an insider I’m thinking the solutions could still be simplified within some basic rules. Keep the football uniforms and the Reck a metallic Old Gold, but try to decide on PMS-124 and sparing amounts of Navy on everything else. Additionally, decide that only one word mark and only one image of Buzz are licensed for use along with the interlocking GT. Too many different logos and alternative word marks will dilute the brand. We should walk into the bookstore and be able to have our choice of white or gold merchandise with a PMS-124 interlocking GT, Buzz, “Georgia Tech”, or “TECH” on it. (Logos from the 80′s and 90′s like the standing buzz on the drop-shadow word mark need to be discontinued, and new logos like Buzz over a Block-T need to either be officially implemented everywhere or not…we can’t afford to “dabble” when the brand is already so poorly defined.) Navy should be so tertiary that it is not available as a background color (unless the football uniforms are going to also use it that way) but only as trim. Black and grays should be eliminated except from Buzz. And, of course, this might be another discussion altogether – but Russell Athletic needs to be switched for a more recognizable and desirable brand for our uniform provider. Debate the practicality and alumni connections all day long, but the fact is our football recruits (the same demographic as the 17 year old prospective students in the aforementioned focus groups) see our use of Russell Athletic as a hindrance to participating in our program. It is a self-inflicted lowering of our branding status. Aspirational brands like Nike, Adidas and Under Armour might cost loads more money, but they would put this fire out. We simply do not know how much better football recruiting and brand image could be if we spent the money and went with a popular brand. I hope you are still open to comments, because I didn’t know about your letter until today (April 11). I like almost everything that you said, and I like the uniformity of the use of gold. HOWEVER, I HATE the use of the color blue in any form for Tech. I don’t care that somebody at Tech arbitrarily decided 10 or 15 years ago that blue is our “official” tertiary color; the tertiary color for Tech SHOULD be BLACK. I don’t like blue jerseys, blue pants, blue polo shirts, blue t-shirts, blue trim, blue anything when it comes to Tech. Give me gold and white in virtually any combination, with black as a highlight or trim color, BUT NOT BLUE !!!! I personally don’t know anyone who loves Tech who likes the use of blue, and I am appalled every time I see one of the Tech coaches with a blue polo-shirt on. If you are going to represent our school, then wear the official colors—-WHITE AND GOLD !!! Very well thought out material and certainly great starting point for “standardizing” not just colors, fonts, etc but also the overall “appearance” for Tech logos. Don’t often like “we used to do it this way” but sometime that is worth a thought. White and Gold was GT when I was there in the 50′s. Recall Tech had a somewhat consistent line of Football and basketball coaches through most of it’s history who focused on “consistency” in performance, ethics and education. Seems to me as we went through a more typical pattern of “coach of the year” moves in many sports, they (or others) may have thought a “change” in our appearance would help establish their “new era” for their sport. It’s old fashion, but the look of Tech football (at home) was plain and simple. Yellow helmets and pants, white jersey and black shoes. Always the same – and most of the results on an off the football field were the same – just “plain damn good athletes representing the Flats with pride”. They won their share of games, too. This is a nice starting point for trying to arrive a balance between keeping both tradition and staying on the leading edge for Tech Athletics and overall Institute images. Yes! I’ve been waiting for something like this! You are my hero! Good luck and keep it up. Well put and I hope this finds its way into the right hands!! I don’t know, I prefer the Brighter Gold. I’d rather the official Gold become the Buzz Gold. The Old Gold is drab and lifeless. Time to get out of the 20′s. Steve, you are a genius!!!!! Your smarter then Albert Einstein!!! 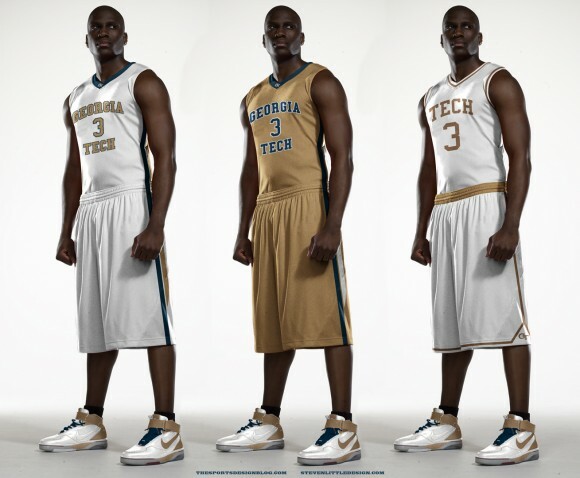 GT needs to get their act together and take your ideas and use them. They are smart, practical, and very well planned. I also like the idea of going to a more recognizable jersey maker. Great idea GT_ Jason!!! The saying “you got to spend money to make money” could go a long way for Tech. Hopefully the AD will get this and make changes to the uniforms. “When you say BUDWEISER…you said it all” GO JACKETS!!!!!!!! Your commentary and ideas are spot on. 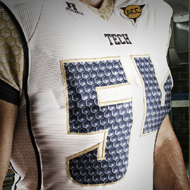 One thing I think Tech misses out on though is the use of the honeycomb design. Its a simple shape that no one else uses and would provide instant brand recognition, much like UNC’s Argyle or NW ‘stripe’. It was used briefly on the gatech.edu website and showed quite well. Great post! I’ve been saying the same thing for years (but have no graphics skills whatsoever). As a huge football fan and alum, it’d be great to see some consistency in our brand as a school. I don’t care if people think the true Tech gold doesn’t look pretty on the shelves… real GT fans will buy it (and probably more of it than the ugly mustard gold stuff we had a few years ago). So many schools are now marketing multi-colored versions of their school merchandise, if someone doesn’t like the official color scheme, then go buy a pink hoodie that says Ga Tech on it (granted, I’ll judge you for not getting the point of school colors). Way to go on these designs!!! Hello! acdkfkk interesting acdkfkk site! I’m really like it! Very, very acdkfkk good! Hello! caadede interesting caadede site! I’m really like it! Very, very caadede good! I am a Graphic Design Student Assistant in one of Georgia Techs many offices and I can relate to your pain at seeing all these inconsistencies. I like most of your redesign but my one criticism is that color of blue. I know it’s the official shade, but if we only have 4 colors to choose from lets pick a different freaking blue. In my opinion it doesn’t really go with any of the other colors, I can only use it in marketing materials by playing with opacity. It’s just annoying. We should update our brand image and we should update our color palette along with it. Well, considering the mascot is a bee, I wpuld think using black instead on navy blue would make ore sense. My school’s mascot is a black bear & black is one of the school colors. But, I guess if Temple can use a “cherry red” owl, it doesn’t matter whether or not a school sticks to a scheme that fits the mascot. I delight in the information on your site. Thank you!. Interesting discussion ! For my two cents if others are requiring a PR SC 2645 , I used a template version here http://goo.gl/UlVdw9. As a fan, recruiting is a big problem and to be honest Russell is killing that. We don’t need adidas or UA, we need Nike. Kids are attracted to the swoosh… yes it’s true. Go to Nike. Holy cow, given this week’s announcement, you just feel pretty damn proud, and rightfully so: the new branding is eerily close to your proposal. Thank you a bunch for sharing this with all people you really realize what you are speaking about! Bookmarked.postwholesale nfl jerseys, Kindly also discuss with my web site =). We will have a link change arrangement between us!